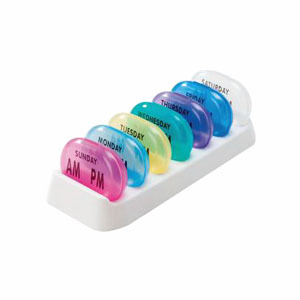 The AM/PM Pocket Med Pack with 7-day tray is a convenient method for holding and organizing your pills or vitamins to help manage a weekly twice-a-day medication regiment. The two-pocket design and easy snap lids securely holds pills and keeps them safe within a drawer, or while on the go in your pocket, purse or bag. Set-up the Pocket Med Pack With 7-Day Tray on your kitchen counter or near your bathroom sink for a convenient and reliable solution for your medication needs. Contoured shape for easy pill removal. Seven daily pill boxes, each with two compartments and snap close lids. Set up your medication needs for the whole week and then take with you for your daily needs. Each compartment can hold up to 25 tablets or pills.